MAKING FAUX FLOWERS LOOK FABULOUS! Don’t we all love flowers in our homes. They are warm and bright and fluffy and happy and for most of us they are not available in our garden all year long! So what’s a girl to do who loves the look of blooms and greens in her home and loves lots of them? The answer is to go faux! There are very impressive faux flowers on the market these days and if done right can fake out the best discerning eye. 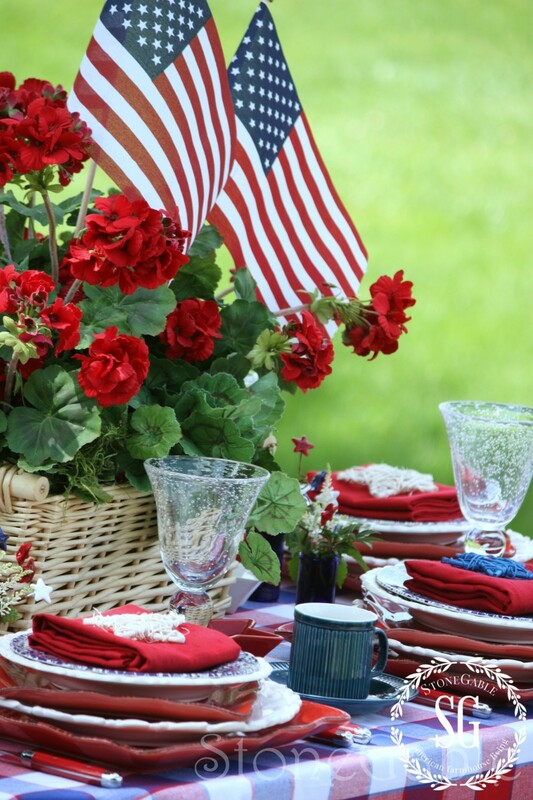 Here are a few diy tips and tricks to help you keep your home blooming all year! 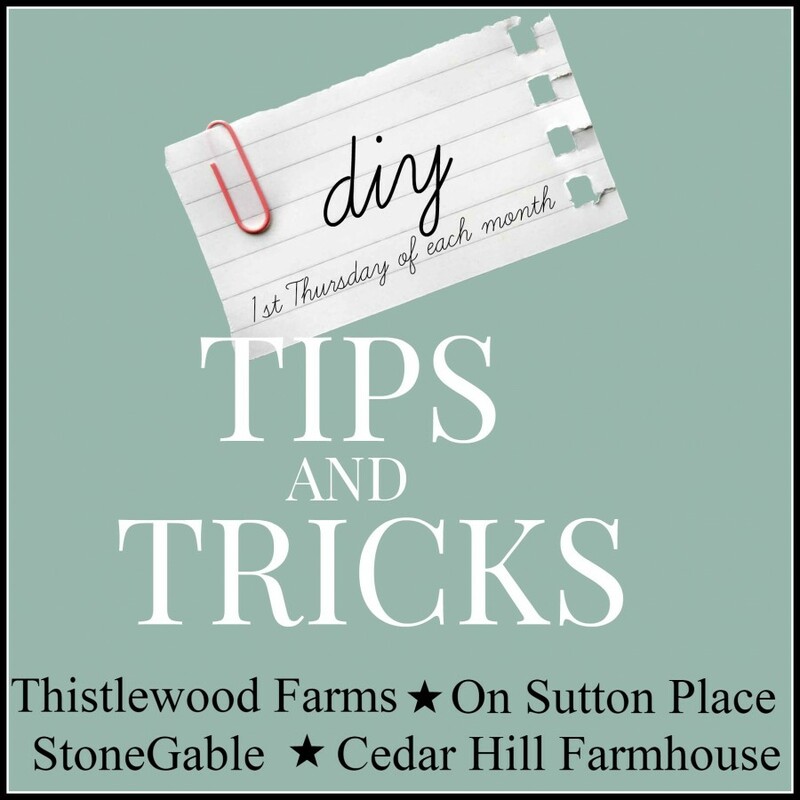 I am thrilled to be a part of DIY TIPS AND TRICKS…SPRING EDITION! 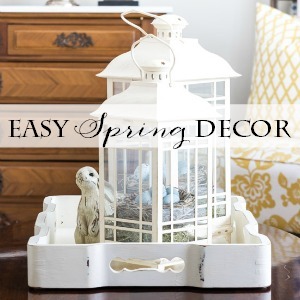 Make sure you check out my blogging buddies who are putting their spin on spring diy tips and tricks! The best advice I can give anyone when using faux blooms and greens is to buy the best fakes you can! This IS where to spend a little extra. It’s really all about making an investment! If the flowers or greens look fake from 5 feet away… pass them up! If you buy a little bit of faux each year soon… you will have a fabulous stockpile to work with. I look for end-of-the-season sales! I feel small local shops are the best place to find great fakes. If you live in my neck of the wood go to The Old Millhouse Shoppes or Amy’s Fresh Vintage or The Candle Barn. Great fakes at pretty good prices. Use faux stems and blooms who’s real counterpoint are in season. It’s a dead giveaway if we have a huge tuscan jar full of sunflowers in March. If they were real, they would cost a small fortune! 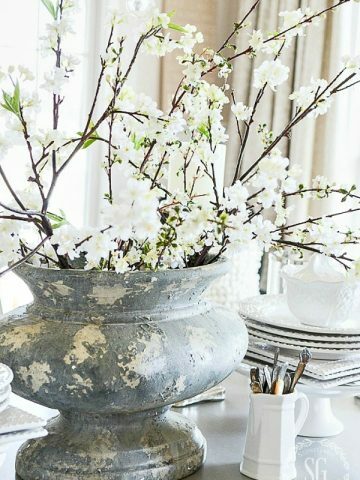 Use faux blooms that are appropriate for what’s blooming outside. I think the only exception are faux blooms that are examples of what we could get reasonably at the grocer’s or local greenhouse. Another exception… tulips! They are becoming the universal go-to bloom! Another thing you can do to help faux bloom and greens and sticks and twigs look more life-like is to always “fluff” EACH STEM! If you plunk a pretty bunch of faux blooms in a vase they will look fake. Open some up, smooth out each leaf, bend each branch and intentionally place them in their container. A little extra care and faux can look quite real! Look for blooms with varying colors. Blooms that are all one flat colors will never pass a real! Also, flowers need to be in different stages of bloom… especially if they are cluster flowers. That’s how they bloom in nature. A stem of completely bloomed flowers all the same shape and size just won’t do! 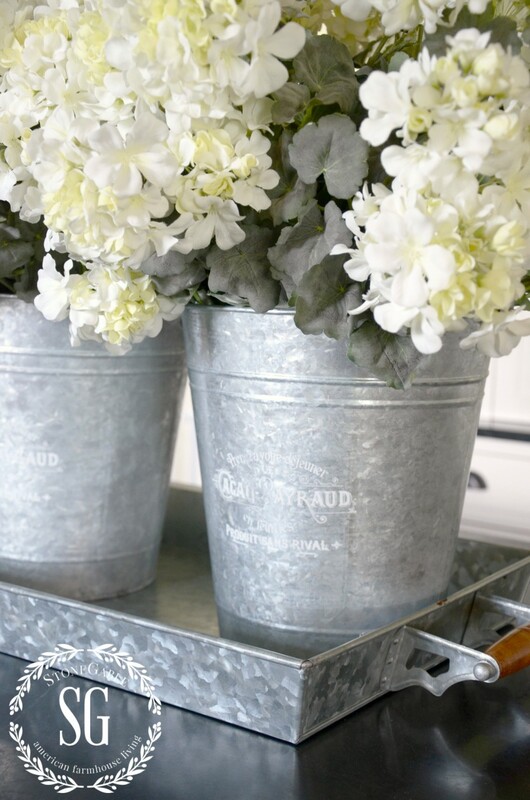 Picking out the perfect container is very important when using faux flowers or greens, especially if they is glass. Try adding moss or smooth rocks to the bottom of a clear vase. It looks a whole lot better than bare leggy branches! And as I always say, use what YOU love! It’s your home and you should surround it with things that are beautiful to you and make your heart sing!!! Remember to pin this to your Pinterest SPRING or DIY or DECOR boards. You can follow me and see what I’ve been pinning lately HERE. Loved your tips on using fake flowers. I realize I’m not fluffing them enough. I loved your faux flowers tips! Could not open the tips on decorating the perfect mantel, though. Just wanted to let you know. Thank you for sharing your decorating tips. I would like to use faux flowers on my mantle. 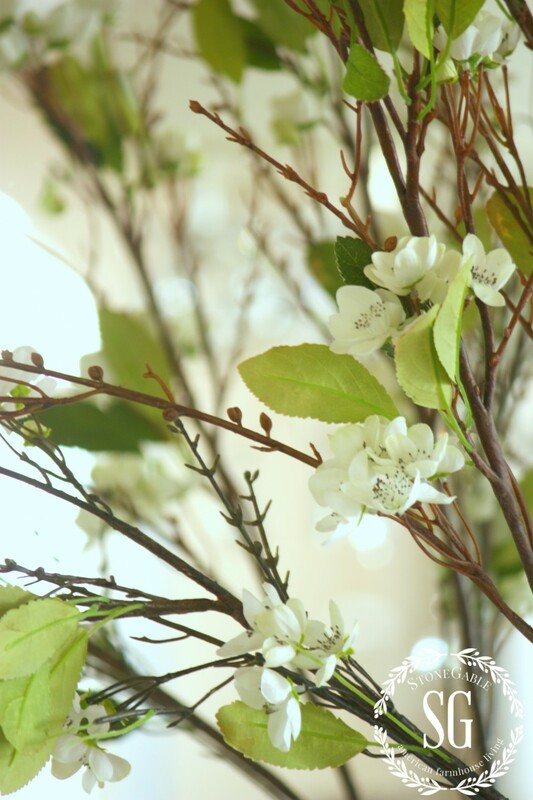 Your blog states to use what is blooming now. What would you use In January? I live in Maryland. Everything is dead! Thanks for your help. I love you’re blog! How about pinecones OR boxwood? As usual, great ideas Yvonne. Some readers had some great ideas too. I love your blog! 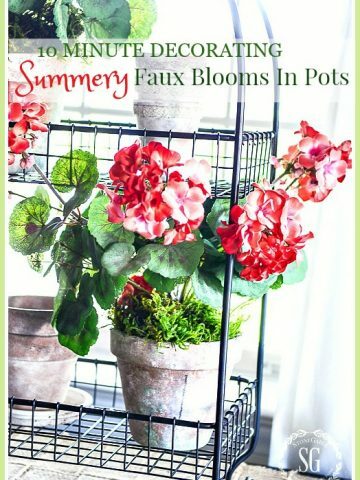 Such helpful information on buying faux flowers! Am loving this blog! You had me at the opening image! I have been so peeved by “snooty” designers both on TV and in magazines that pooh-pooh faux flowers in room decor, and yet I see lovely arrangements offered in very posh catalogs–go figure! The only silk flowers I knew about as a child were the delicate ones my grandmother fashioned for the hats and ball gowns she made. The first “decor” flowers I ever saw were long-stemmed PLASTIC roses–I was so enchanted I spent my whole allowance on one of every color (even turquoise and purple) and jammed them into a vase I got at a tag sale…I thought they were gorgeous (I was eleven) My tastes and sense of design has changed a lot since then. Thank you for the faux flowere affirmation/inspiration! I agree all your ideas are great. I love to have flowers real/fake in my entrance way all year round. 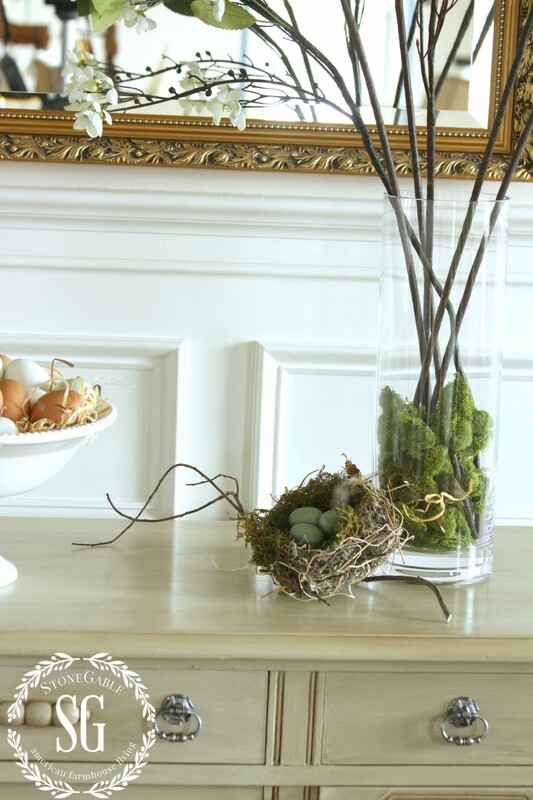 I changed them seasonally and add to my fake flower arrangements real branches and sticks. So simple, but so helpful I really needed this post. Thanks so much! One little error I often see regarding the use of faux flowers is leaving the same flowers out every month instead of being aware of the calendar and changing them according to the Season. For instance, tulips in a vase look lovely in April but awful in August!! I have some unbelievably realistic peonies that I’d love to display much longer than I do but I force myself to put them away in mid-July! Hope the healing is coming along well, Yvonne!! Nice blog. Artificial flowers are better, Its easy to maintain, affordable and now its easily available online. I have purchased some artificial flowers from Fourwalls.in, They look very close to real. You have such lovely ideas! I added a comment above where I said I carefully snip off a few petals to lay at the base of the vase or bucket to mimic real flowers dropping their petals. I forgot to mention that besides that and also bending stems, etc., if any stems (or leaves) look too green and fake, I get out my craft acrylic paints and paint the areas I don’t like. To paint the too-bright leaves, I dilute the paint with water (about half and half) and gently stroke it on. Usually with the too-bright stems, I use the paint full strength. Very timely and practical too. Flowers are starting to fade now as the temps drop. Thanks! Thanks for the great tips, Yvonne! I’ve found the best silk flowers at my local thrift store. I don’t know who has donated them, but most of them were brand new with the tags still on. I’ve also used a doily in the bottom of a vase and even some dried peat moss. Are those sunflowers really fake? If yes, please share where you got them. Thanks and Have A Blessed Day. It’s amazing how beautiful and realistic some faux flowers look, and others not so much. Thanks for the great tips on buying and displaying fake flowers to make them look real. My favorite right now are some white roses. Hello, where do you buy your flowers? I have looked everywhere and ordered online only to be disappointed when they arrive. Thank you! Yes, I agree …. buy the best faux flowers you can afford. Two other tricks I do (besides bending the leaves, stems and opening some of the blooms) is I gently snip one, two or three petals and place them at the base of the container to mimic the way real flowers drop petals after a few days and secondly, if using a clear glass vase, add some water. I just love your blog – you are extremely talented! 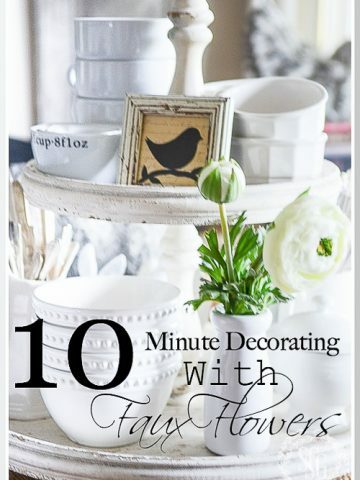 Great advice, I’m starting to take pictures of my products and love to use flowers in them, but couldn’t get the right “feel” from the fake flowers I have.. Off to try these tips!! I just read thru the comments on this post and realized you are talking about some my very favorite stores in Lancaster. I live in Virginia but shopped many years on annual family vacation at these very stores with two very important ladies in my life. I found so much joy shopping at these stores and bringing home to VA my new Treasures. Your blog has spoken to my heart and brings back the very happy memories of the shopping I did with my mother and step-mom at these stores. I know they are smiling down from heaven watching me carry on the tradition of decorating for the seasons and making my home warm and cozy. Just wanted to share and say Thank you for this blog, keep up the beautiful inspiring work. God bless! OH HOW SWEET! Thanks for letting me know Debra! I’m so happy this post brought back such precious memories! You will love this little shop! Very good tips, girl and those tulips do look real. My hubby is asthmatic and I am allergic to— just name it. So, I am into faux started last year. I got them from one of my favorite shops! Fresh Vintage By Amy in Strasburg Pa! Aren’t they cute? Great tips! I’m all for anything that lasts longer than a day! You go girl! And yes!!!!! I’m going to Haven! Hope to see you there! Does anyone know of an online source for high quality faux flowers? I love your website. Thank you for your wonderful ideas and generosity in sharing. I get mine locally. I want to see how they look. I buy from Pottery Barn… they are very nice, but I think they are a tad pricey! It’s all lovely, but what really caught my eye is the moss in the vase. I love, love that look!! Those of us with cats who view fresh flowers as salad quickly learn that our flowers have to be fake or have to live in the bathroom or powder room with the door closed, Fake flowers are the answer and they are so much fun to play with. Our youngest cat still has to sniff the fakes to make sure it isn’t a snack. After that one sniff he moves on to some other form of mischief! Thanks for the tips. I would also mention that if you are in the wilds of southwestern Lancaster County you can find great fakes and real stuff at Eve’s Garden on 999. Love her store and thank goodness because there is NOTHING down here in what my friends refer to as the boonies! Yes, you are right! I really should have mentioned her. LOVE her fun place! See you Saturday! 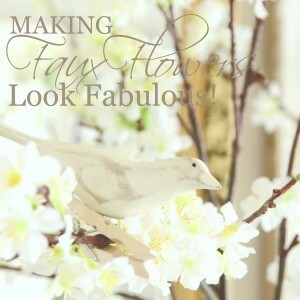 GREAT Tips on using faux florals, dear friend!!! I remember many years ago, when styling vignettes in the Antique Shop. . . I always “fluffed” the faux silk florals! Best quality & fluffing are key!!! I adore the monochromatic stems with touches of green leaves and blossoms!!! This DIY on the first Thursday of each mont. . .it’s a “Good Thing”!!! 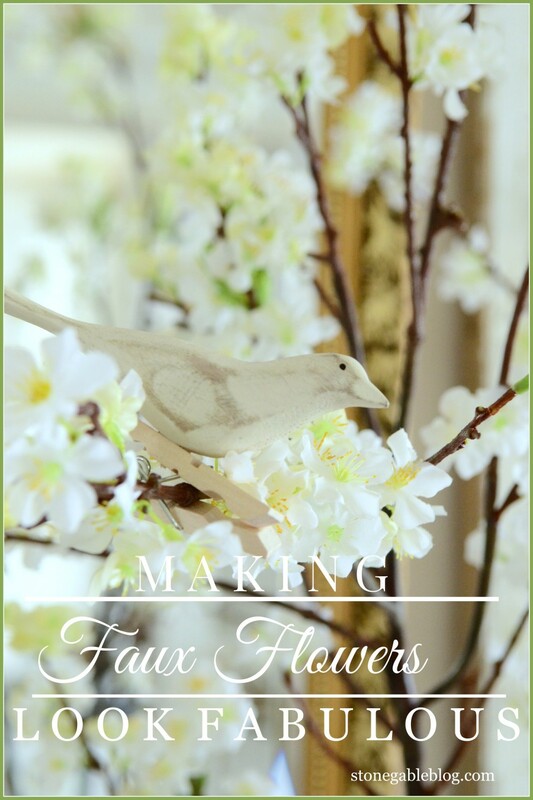 Great tips for using faux flowers! 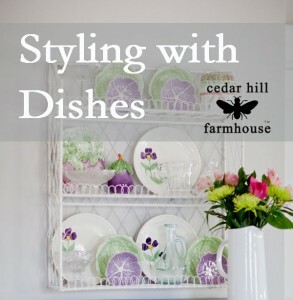 Love your styling, containers and accessories!! You have such an eye for detail. Your comment about the price of fresh flowers when not “in season” may be true for your area, but a good florist can get almost any flower year round and the price should not be much more, if any at all. For example, my store carries sunflowers year round, we just have to get them from another area/grower worldwide. I can’t wait to get in my garden! You are very lucky! 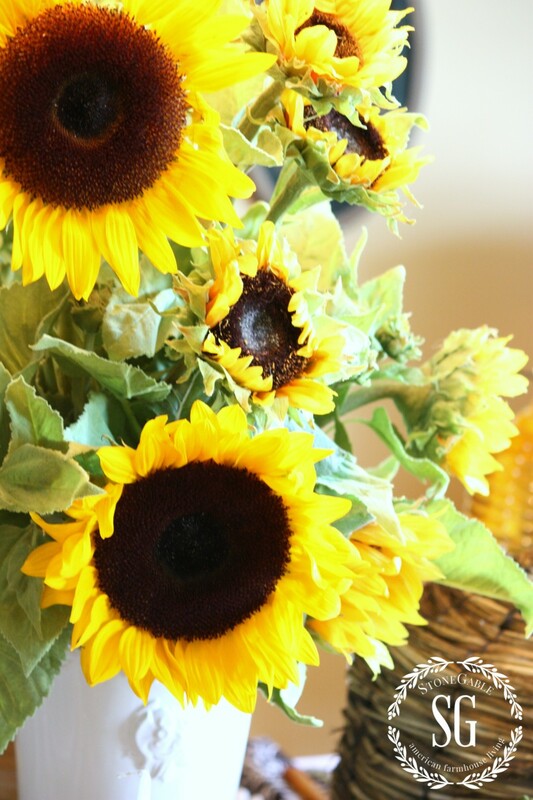 Sunflowers and other popular out-of-season are very pricey here! Thanks for the tips,very eye opening,never thought of doing some of those things to make them look real. These are great tips. I think faux can work well if we remember to use flowers in their real colors, and do something like you did to hide the bare stems. Such a pretty blog and your photos are wonderful! Fabulous tip, Deanna! I so agree! THanks for sharing your thoughts! Love the look of quality faux flowers…and you use them so beautifully Yvonne! The problem may not be with your blog, because I’ve been having really weird problems with my computer – though I thought they were fixed, but I’m seeing some odd advertisements in your right side bar that don’t seem like your normal ads, plus some of them are appearing in very “skinny, long” boxes and the words are strung out with lots of empty white space, plus one or two appeared in the main body of text. Also, some of the images in the right sidebar that are normally under the title of a previous post, just have a little blue box with a white question mark in it. So, not sure if it’s my computer acting up, or if there is a problem on your site. I cleared my browsing history and came back to your post, but its still happening. I thought I’d just let you know in case it’s not my computer this time and you want to check it out. 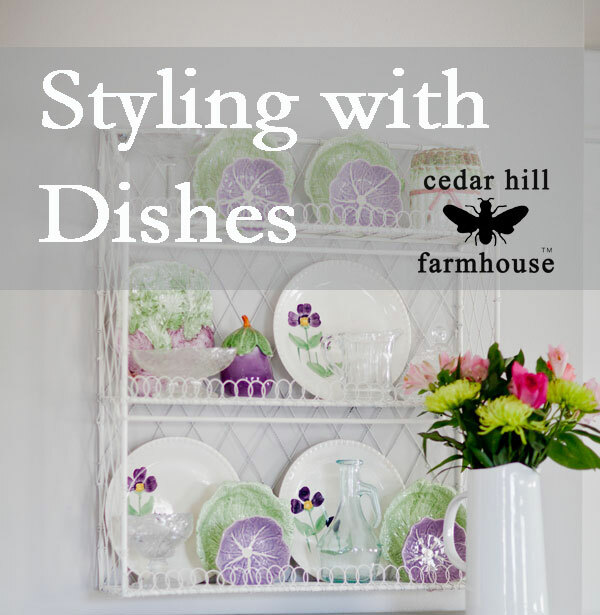 It first happened after I clicked not the “Styling with Dishes” image – then when I came back to your blog, these oddities appeared. Hope it’s nothing serious! So sorry you are having a problem! I hope it get’s cleared up soon. I do have small ad’s pop up in my post, but they should be nothing very distracting at all. 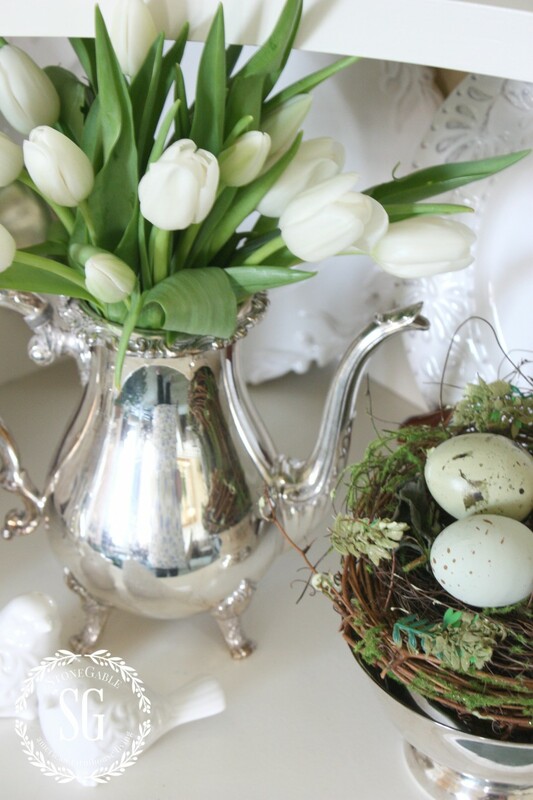 great tips Yvonne, I don’t like to use faux, but have discovered that they can look real if surrounded by other natural elements~I love your tulips in the silver pitcher, even cheap grocery store flowers can look fabulous if you stage them right! Thanks for sharing your great tips Jenna! LOVE it when readers share with us!!! Made my day! Thank you, Yvonne, for this cheerful post on this very snowy day–can you believe it’s snowing AGAIN in our little part of the world? Looks so pretty, but hate to drive in it. I love that you added the places to shop as it’s always great finding new places. I just love the shops you mentioned, and could spend hours at the gorgeous Old Millhouse one. Even driving up to it on the winding bend in the road is lovely! We are so lucky to have so many nice places nearby, aren’t we? I didn’t know the Old Candle Barn had quality faux flowers, so I’ll just have to check them out. Another sweet little shop for all you locals out there or anyone visiting our beautiful neck of the woods is The Carriage House on routes 82 and 926 in Willowdale, PA. They also carry the realistic looking faux flowers and quality real boxwood topiaries. Their Springtime open house is this week-end…..know where I’ll be lol! Two more shops I frequent that carry lovely things are Petals in Montchanin, DE and Dezins in Wilmington, DE. Maybe I’ll run into you at one–that would be lovely! Stay warm and cozy. I would have never guessed that many of those were faux’s they look fab girl. Yvonne, thank you. So many bloggers trash the use of faux florals on their blogs. I am a Gardner and love to be outdoors tending my flowers so I don’t want to fool with fresh arrangements inside too. I have invested in quality faux flowers which were arranged by professional florists. Some of the biggest ones were done for the Breakers Hotel on the Ocean in Palm Beach. They are amazing. And expensive! But my husband got them for me from doing electrical work at their wholesale warehouse :-). A trick I learned is to make a tea bath and soak the faux flowers in the bath to take the edge of the fakeness, it really works and does not change the color hardly. Different strength baths for different colors should be tested first though to be sure. 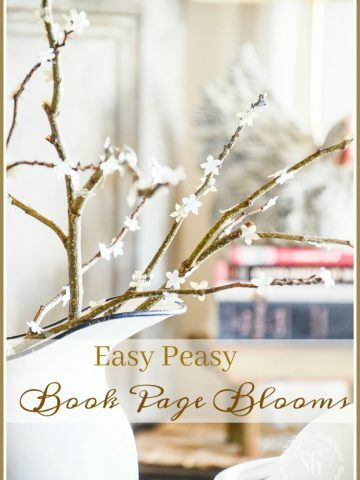 I love faux flowers, but I am also picky! Where I live I do not see fall colors until very late in the season, so when I decorate for fall at the end of September/early October I have to fake it! I’m always on the lookout for good quality faux florals. 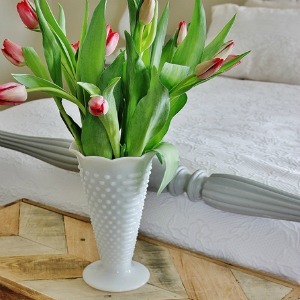 I love tulips in the spring, and am currently hunting for some realistic ones to put in my white pitcher on my kitchen table! Have a lovely day! Super tips Yvonne and I am craving flowers right now, with nothing in bloom yet in Kansas City!! As usual you share such great and beautiful ideas and tips for decorating the home, that makes it brighter, prettier and cheery! I just pinned it too. Thank you so much dear Ivonne.